Obtaining three moving quotes is recommended and considered an important step of a well-planned move. Having three quotes provides you with a basis of comparison to see if estimates are fairly similar or way off. You can also feel confident that you’ve done your homework and not just accepted the first mover you spoke to or the one who quoted a reasonable price. That said, there are many important factors to take into account when going over the details of a quote and making your final selection. Moving is widely acknowledged as a stressful life event. Affordable Moving & Storage believes that your moving company, along with their services and charges, should not cause or contribute to that stress. We’re so confident about our transparency and affordability that we’re happy to provide you with a checklist of what to look for when seeking and comparing quotes. The company should ask as many questions as you do! A good honest mover will obtain the most information possible from you in order to provide you with an accurate quote. The mover must provide a written estimate and is required by law to send a contract to you at least 24 hours in advance of your move date. A dishonest company won’t send a contract, which may mean they have decided not to show up because a more profitable move comes along or they may have intentions to spike the charges. Sufficient insurance coverage must be available and offered to you. The moving company should not charge by the cubic foot. On local moves no additional fees or penalties should be added for blanket use, stairs, or additional packing boxes that you did not request. This is a tactic used by companies with low hourly rates to prey on the customers that focus solely on the hourly rate when choosing a mover. When looking for moving companies in New Jersey, it’s always worth your while to obtain a quote from Affordable Moving & Storage. As our name indicates, our rates are highly competitive. That’s because we’re local moving experts who complete numerous jobs in a day. Our moving quotes always include an itemized inventory and written estimate that we stand behind so there are no surprises at the end of the day. The top quality service and care we provide set us apart from most low budget movers. Unlike other moving companies in New Jersey, with Affordable Moving & Storage, you don’t overpay for filling half a truck. We specialize in affordable small moves and have lower minimums than most other companies. As the premier affordable moving company, we also don’t add extra fees for last minute jobs. An experienced professional mover understands that complications with mortgages, closings and the like arise and jobs may have to be scheduled later than you hoped. Some moving companies use casual labor to cut costs and make moving quotes more competitive. 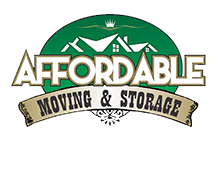 Affordable Moving & Storage only employs experienced staff who have the training necessary to execute your move smoothly as well as transport your furniture and other valuables safely. By using a New Jersey moving company like Affordable Moving & Storage, you’ll avoid extra charges for gas and mileage. The shorter distances also ensure that your move is completed quickly and on schedule. In the event of damages or a claim, it’s easier to resolve with a smaller local business than a large complex company. Unlike unlicensed movers, Affordable Moving & Storage has a workers’ compensation policy which protects our employees in the event of a slip or fall. Without this coverage, the worker could sue the homeowner. Our excellent reputation as an affordable moving company in our home state of New Jersey and beyond is built on word of mouth and referrals. We always try to satisfy our customers because we depend on you for reoccuring business. Beware of moving companies that insist you submit requests for quotes and additional questions solely through their website. Affordable Moving & Storage offers online quotes for your convenience but supplements that with friendly personalized service.